MKEK acquired german machineries to manufacture weapons as many middle-eastern industries did (as DIO of Iran and POF of Pakistan). 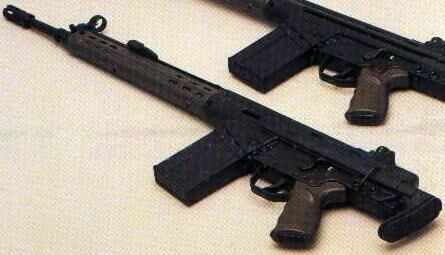 The G3A7A1 is a turkish copy of the german HECKLER&KOCH G3A4 short battle rifle. It fires the 7'62x51mm NATO cartridge, feeding from a 20-rounds magazine. It features an S-1-20 trigger group, a metal collapsing buttstock, and an "old-style" ventilated handguard. It is the standard short battle rifle for some units of the Turkish infantry, such as airborne troops and APC personnel. Please note: BATTLE RIFLE, not ASSAULT RIFLE, since is no more in use by the most of the turkish armed forces, and is retained only by some units due to its major punch compared to the 5'56-NATO cartridge.